"I can't begin to describe how elated I was at having seen and re-tread the land, once again, after satisfying my deep longing to see the northern provinces. No easier is it for me to pen my thoughts on which sublime and mesmerizing impressions the wealth of natural beauty and unrivalled settings leave upon the mind of an observer. These impressions not only overwhelmed me for a brief moment, but they, too, influenced my entire future since I never yet, neither abroad nor other places in our country, have had the occasion to gaze at something so awe-inspiring and exciting as that which I observed during this journey to Finnmark. Unsurpassed in the northern provinces is the beauty of nature, while humans - nature's children - play but a minor role, in comparison." Balke was one of the first to describe northern Norwegian nature in a positive light. The wilderness of the mountains gave rise to inspiration in romantic esthetics. Nature was no longer looked upon as simply hideous and frightening, and, in Norway, Balke was one of the first to acknowledge this. His pictures of northern Norway are frequently found painted in subdued shades of color that reinforce their dramatic nature. 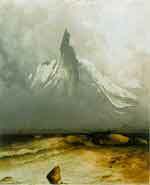 And it was first in the 1860s that Balke reached his climax as a master painter of northern Norwegian nature. This can be seen, for instance, in the picture of Vardøhus fortress. Balke stayed in Paris from 1846-1847. He knew that King Louis-Philippe was extremely interested in northern Norway. As a young prince, the king had secretly visited the North Cape in 1795. This journey had made a lasting impression, and Balke believed that perhaps the king would be interested in pictures which reminded him of the events of his youth. Balke contacted the king to show him some sketches, and the king immediately ordered thirty paintings for Versaille. The February Revolution of 1848, however, hindered the completion of the pictures, but Balke's sketches may still be found in the storerooms of the Louvre.